Inside 37signals’ new office in Chicago. When you’re a company that focuses on productivity tools, you set a high bar for you own practices. For the last seven years, 37signals, a company that produces products like the project management software Campfire and Basecamp, as well as the popular blog Signal vs. Noise, prided themselves on their flexible working habits, even though those habits were born out of necessity. The team rented out five desks within the Chicago creative firm Coudal, and as the staff outgrew the ratio of employees to desks, they flexed their hours and relied on their products to collaborate remotely. But about two years ago 37signals witnessed a mini-boom: Their book Rework boosted their business, and they began to see a trend that their audience was moving more mainstream, with clients outside of the technology world. The shared office at Coudal didn’t allow for much privacy, plus they needed a place where their roughly 10 non-Chicagoan 37signal employees could work when they came in town. 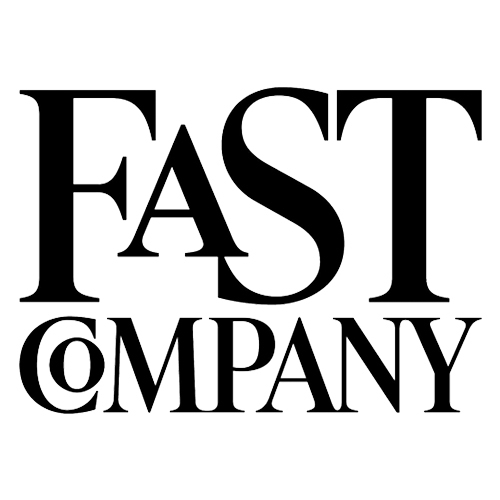 “We build software, which is much easier than building an office,” admits Jason Fried, co-founder and president of 37signals. But this week they’ve placed the finishing touches on a new office that acts as the physical embodiment of their productivity principles. Fried tapped architect Brad Lynch of Brininstool, Kerwin & Lynch to build out a 10,000 square-foot space in the West Loop neighborhood of Chicago that was previously used as photography studio for Crate and Barrel. Dividing the space into two main volumes, one for socializing one for computer time, and with a series of smaller room at the core, the company now has enough room to work efficiently and entertain, especially with the addition of a theatre — with 37 seats, of course — that allows them to host events, workshops and conferences, bringing clients and collaborators into the space. The most important element of the space was, well, space — lots of space. An extremely open plan devotes the most area to what people use the most: a kitchen, with lots of seating at long tables, and a room of personal workspaces flooded with natural light. “My feeling is that being cramped is a form of stress,” he says, when talking about the clutter of cubicles one normally encounters at an office. So Fried worked hard to keep hallways extremely wide (up to 12 feet), and pushed for the maximum square-footage for open area. Desks at the 37signals space — custom built abstracted forms that incorporate planes of utilitarian cork — are surrounded by acres of personal space around each desks, which minimizes interactions with other co-workers and replicates the spacious comfort of an employee’s home office, says Fried. 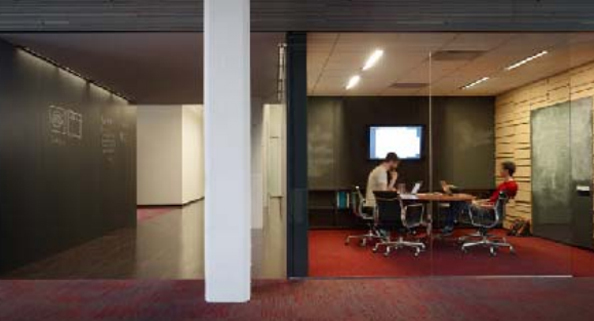 “I think people would get more work done if they weren’t assaulted by interruptions.” To minimize distractions, two clusters of smaller room types at the center of the space maximize privacy: team rooms, for group meetings, and tiny closet-sized room for phone calls. When it came to finishes, Fried wanted surfaces that were not only visually interesting, but also showed evidence of a handmade aesthetic. “We’re big believers in handmand software. We think about every detail, about every pixel, about every word,” he says. “One of the first things I said was that I want this office to have a lot of textures, lots of hand-crafted high-end materials that said quality. 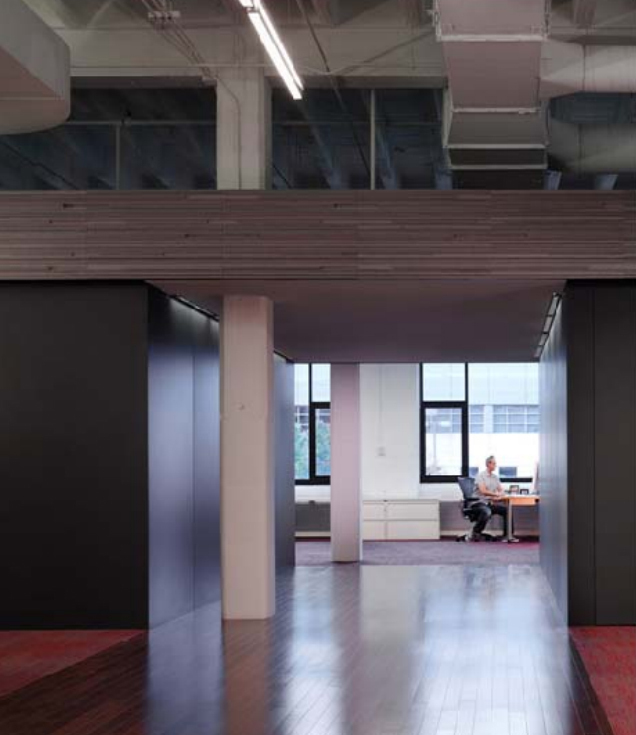 The things you surround yourself with have a big influence on the quality of work you do.” To add that quality — and help humanize the mostly industrial interiors — Lynch infused the space with color and texture. 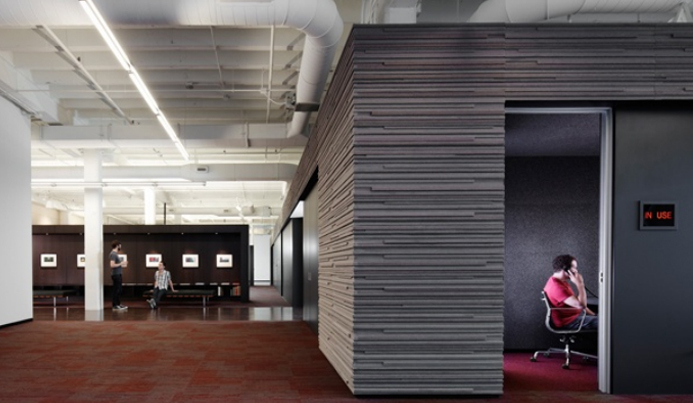 The office exudes extreme warmth, both from the glossy walnut floors and the use of a wood called lacewood, with a grain that almost looks pixelated up close — a shout out to their digitized world. 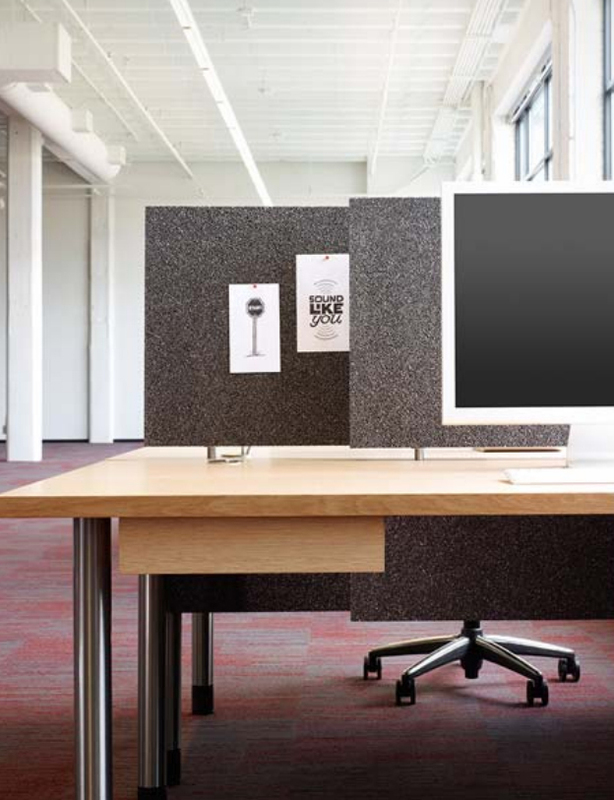 One handcrafted detail that also serves a practical purpose is the walls made from stacked pieces of heavy-duty felt. The team at Stay-Straight Manufacturing, who fabricated all 37signal’s custom finishes, enthusiastically took on the challenge of working with a new material in an unusual role, which not only gives a literal warm fuzzy feeling to the room, it helps to absorb sound. 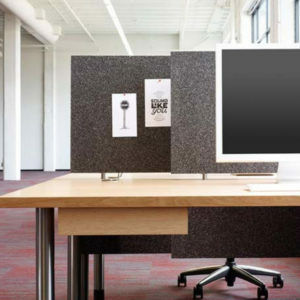 In the team rooms, which are made for small meetings and other brainstorming events, a similar technique is used that employs stacked pieces of cork, which of course can also double as a bulletin board. These little details affect employees, even subliminally, says Fried. “Even if you don’t think about it, we know the story of it and we can appreciate, “he says. 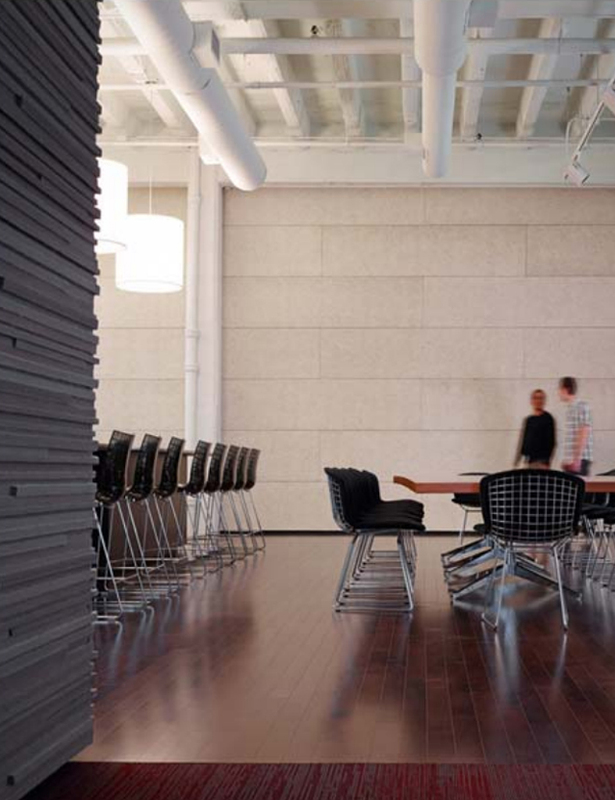 The flexibility of the cork also allows the walls to the space to become a rotating, temporary gallery. One of those walls is already being used to remind them of their focus on the customer: 37signals is recruiting photos from their users, which they’ll post with a corresponding map on a wall. You can see some of the photos they’ve already collected online. They’ll continue to layer if up as more photos from customers arrive. One detail you might think is remiss for a creative company: No whiteboards. “I can’t stand whiteboards, “says Fried, as he ticks off their shortcomings: they squeak, the markers smell bad, they never erase completely, they don’t age well. Instead, large black chalkboards, which are also magnetic, cover most of the walls of the space. “I like the patina and the sound and feel the chalk makes,” he says. Although it has come at a cost. “We’re a paperless office, but now we’re dust-full,” laughs Fried. The team moved into a near-finished space in July and immediately noticed one drastic change: Even though the space is made for maximum flexibility, Fried says more people are actually coming in to the office more of the time. Face time isn’t seen as a distraction anymore, and the creation of the team rooms allow for people to comfortably collaborate in person, without having to head out of the office for meetings, or gather in a corner and keep their voices down.